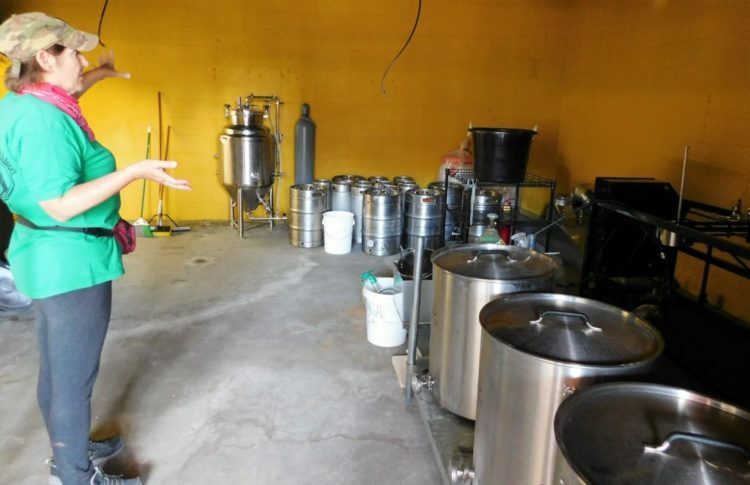 Barbara Ritter, one of the owners of the Brewhaus, shows some of the work being done in the new taproom of the microbrewery. 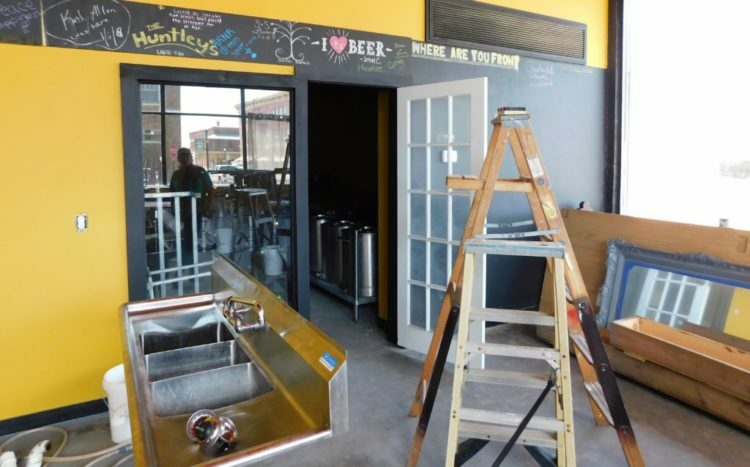 Boiler Room Brewhaus is expanding. 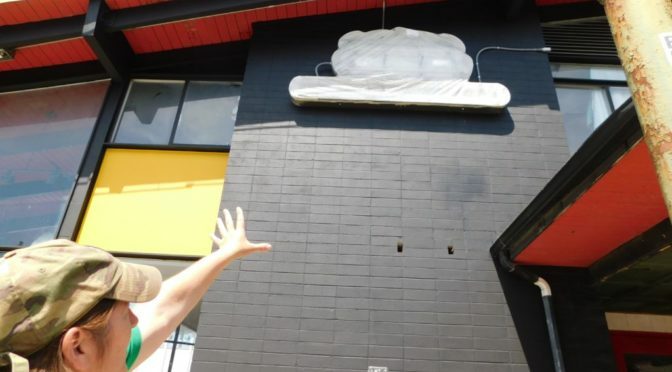 The microbrewery is moving from 102 S. National Avenue to 10 S. National Avenue, the historic Downtowner Hotel. Bryan Ritter left, and his brother, Dan Ritter, Stillwell, Ks. work on the new bar in the taproom Tuesday morning. There are additional advantages to the location at the corner of National Avenue and Wall Street, “Two of the busiest streets in Fort Scott,” she said. “It’s all on one level, more patrons will have easier access, it has handicapped accessible restrooms, visibility is pretty significant and there is a lot more room for cold storage, like a bigger refrigerator. We will now have a refrigerated room to put kegs in…trucks can come up to deliver grain, and more storage,” Ritter said. The door to the brew room, the former kitchen of the Downtowner Hotel. 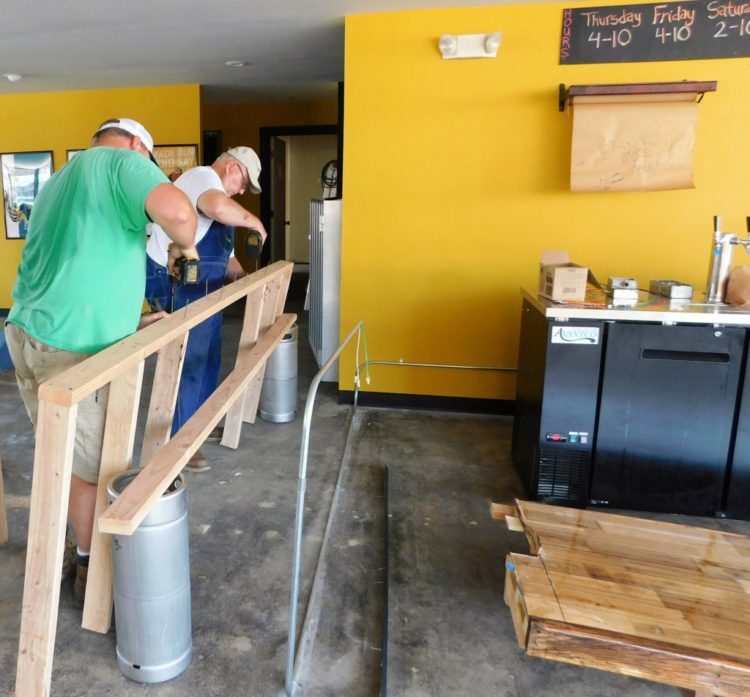 The brew room will allow more beer to be made for the microbrewery, Ritter said. 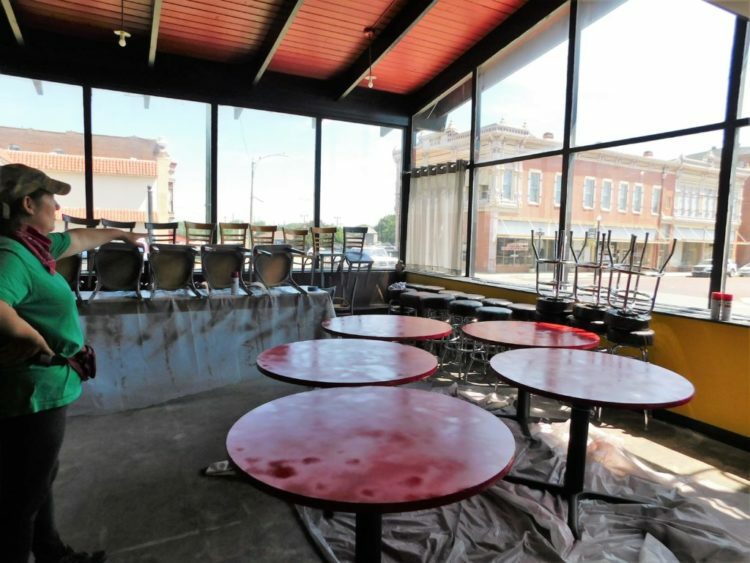 Future plans also include an outside patio area for customers, under the carport on the south portion of the building. 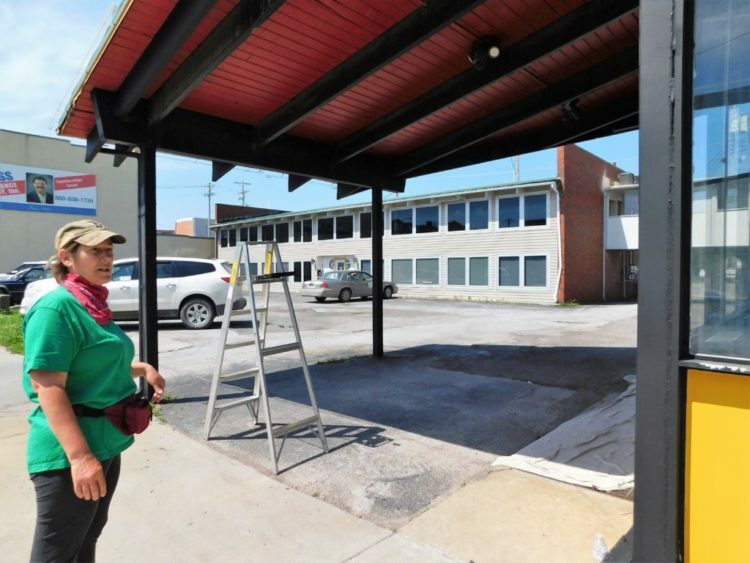 Barbara Ritter shows the area that will be the outside patio space of the microbrewery Tuesday morning. 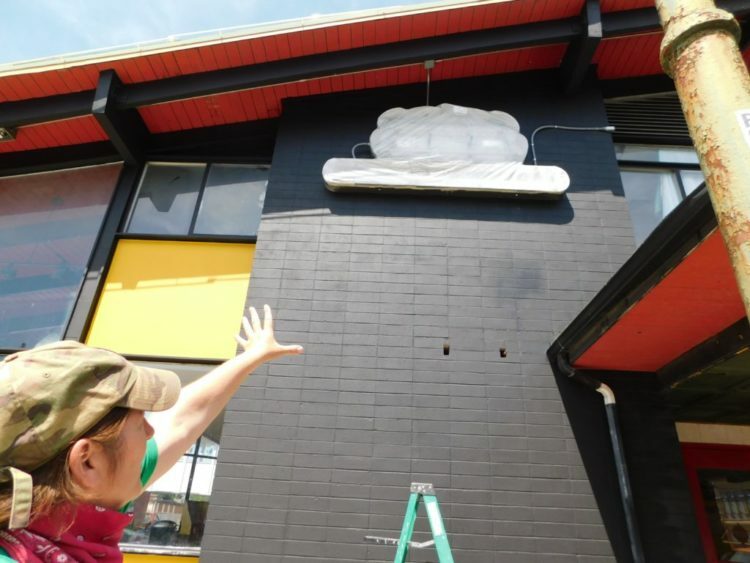 The Ritters, she and her sister-in-law Peggy Ritters are the owners, will have a “soft” opening at the new location Friday, June 1 at 4 p.m. “to celebrate with people and say thanks for all your help and support,” she said. Ritter also wanted to thank Bobby and Denise Duncan for letting them start their business in their building, Ritter said. Josh Jones, the owner of the Downtowner building has been repairing and updating the new site for them. “He’s done all the painting, replaced glass, changed locks, plumbing and took up all the carpet and sanded the floor,” Ritter said. 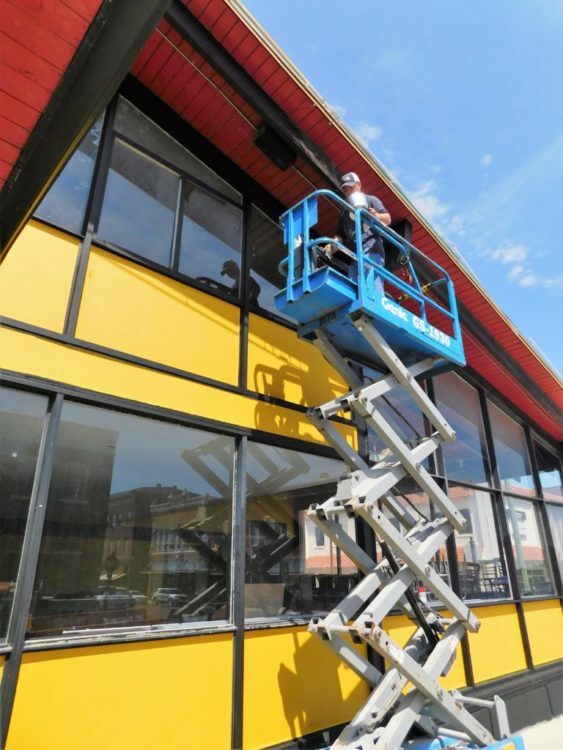 Charles Corpstein is painting the exterior of the Boiler Room Brewhaus Tuesday morning. He is employed by Josh Jones, he said. Saturday, June 2 is the public ribbon cutting at 1:45 p.m. just before they open at 2. Hours for the microbrewery remain Thursday-Friday from 4-10 p.m.
Saturdays from 2 to 10 p.m. and Sundays from 2 to 7 p.m. The old neon sign is being refurbished by Darren Crays, Ritter said. The Ritters lobbied for a change in local law, so they won’t have to have 30 percent of their profit in food sales at the microbrewery. Liquor by the drink laws in Kansas from information provided by Ritter. 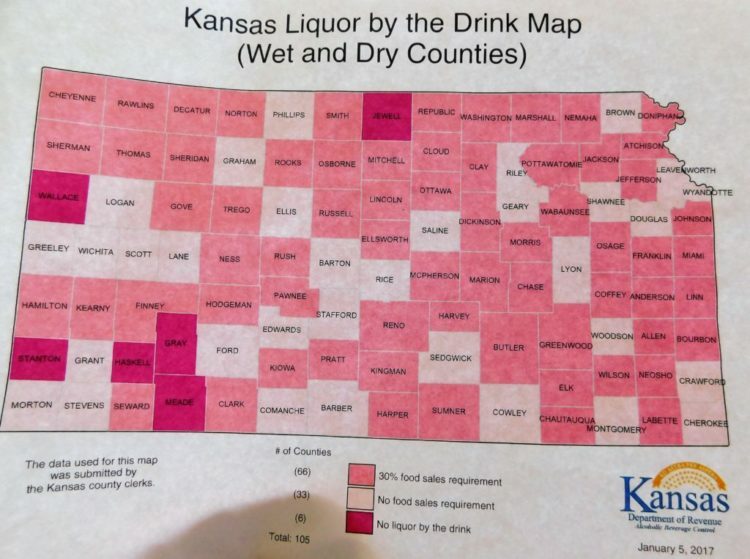 As of January 2017, 66 counties (shaded in medium pink above) in Kansas require there be 30 percent of profits in food sales on the premises to be able to sell liquor, 33 (light pink) counties don’t have that requirement and six counties (dark pink) are “dry” counties, and have no liquor by the drink. Currently, Bourbon County requires 30 percent food sales in a business that sells liquor. “It has been approved to put it on the November 2018 ballot to say you do not need to have 30 percent food sales to sell alcohol,” Ritter said.